Preheat your oven to 350F and line a bread pan with parchment paper or lightly grease with oil In a small bowl, combine the ground flaxseed and filtered water to form your “flax egg.” Stir and set aside for 5 minutes to gel. Add the oat flour, pumpkin pie spice, and baking powder to a bowl and toss with a fork to combine. Add dry ingredients to the "flax egg" bowl, then add in the pumpkin, maple syrup, nut butter, and lemon juice. Stir until well combined and thick, with no visible flour. Gently fold in one of the chopped chocolate bars. Spread the batter into a bread pan and even out with a spatula. Add the second chopped chocolate bar on top. Bake bread for 45-55 minutes, until the top is firm to the touch and the edges start to pull away from the pan. Careful not to over-bake or the bread or it will lose its moisture! Remove from the oven and transfer to a cooling rack. Allow to cool completely before slicing. 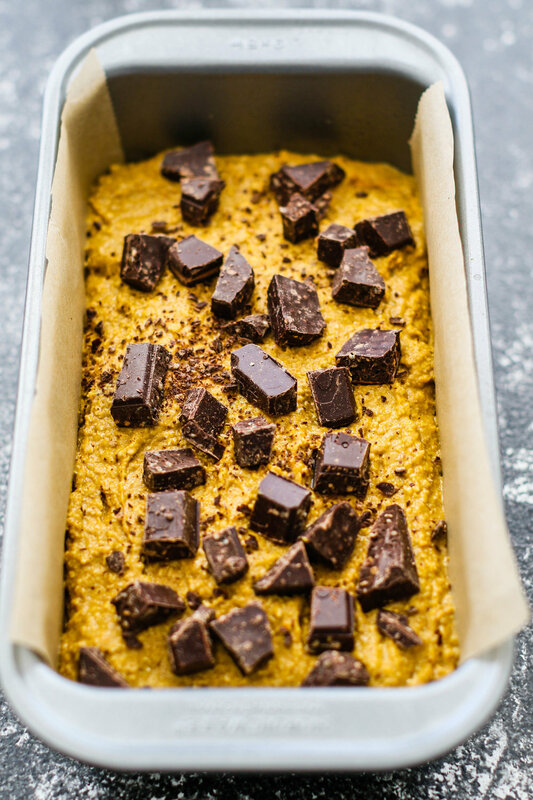 Store leftover pumpkin chocolate chunk bread in the fridge for up to one week and freeze for long term storage.